Catch someone's eye with fresh seasonal flowers in colorful red, orange, purple, and lavender hues. 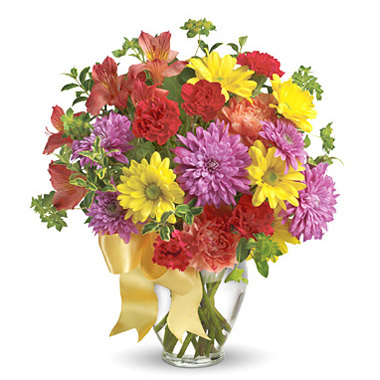 This popular vased bouquet features alstroemeria, carnations, daisies, chrysanthemums, or similar fresh blooms. Great for a birthday, get well, thanks, or just thinking of you. Approximately 11 to 13 inches in height. Available for delivery throughout Chicago and suburbs.